Things are looking up for 27-year-old Jason Terrell and 28-year-old Mario-Jovan Shaw. 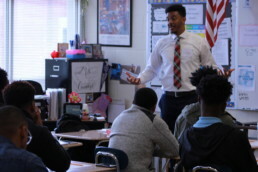 Three years ago, the two Charlotte-Mecklenburg Schools teachers quit their jobs to form an organization that would not only focus on attracting African-American men to the classroom but provide them with support so they would stay. Then and now, only 2 percent of teachers nationwide are African-American men, and, according to the U.S. Department of Education, they leave the classroom at higher rates than any other groups. Shaw and Terrell wanted to help turn that around. On a shoestring budget, the two founded Profound Gentlemen, and after a lot of hard work, long hours and fine-tuning along the way, the organization has attracted grants and other financial backing. It also has a 100 percent retention rate of the teachers who are its members. “We have 225 members in Charlotte, Atlanta, Chicago, Washington, D.C., and Memphis, and last year, they all came back, with a few getting higher positions and pay,” Terrell said, sitting in their new office space on Freedom Drive. Just a year ago, Terrell and Shaw could be seen in coffee shops, bakeries and restaurants all over the city, glued to their computers and cell phones as they worked to get Profound Gentlemen up and running. They held meetings with members, potential donors and others in various locations because they couldn’t afford office space. They’ve since received numerous grants, such as $15,000 award from United Way of Charlotte that they used partially to help teachers at three Charlotte schools — Charlotte Learning Academy, Eastway Middle and Olympic High schools — develop community projects for their students. The Kenan Charitable Trust gave the group a $200,000 award, which has allowed them to expand their reach in the state. A Duke Energy grant made it possible for them to partner with a few STEM schools and increase their recruitment efforts for African-American STEM teachers. The organization also was awarded a $20,000 Echoing Green Award, which made it possible for them to have office space, which they use mainly as a meeting place for teachers. “We wanted them to have a place to come after school too and do their printing, read or just talk about any problems they may be having or just to hang out and support each other,” Terrell said. That support is important because black male teachers often report feeling isolated with no other males of color at their schools, and many list a lack of support from administrators and colleagues as a major reason they leave. From day one, Profound Gentlemen was about having systems set up where members could contact them and the leadership teams they formed in the cities where they have members, either by phone, online or in person. They’ve come with issues that range from problems with a lesson plan or a student to wanting to quit or needing advice on dealing with colleagues and parents. Often it was simply letting members know someone was there to listen to them – someone who knew what they were going through. Profound Gentlemen still offers that kind of support, but Shaw said they have expanded their focus. “We’ve shifted to include leadership training as a big part of what we do, so our members can become lead and master teachers, principals and speak at school board meetings,” he said. “We’re offering them leadership development seminars, because some of them don’t know how to connect to those opportunities and no one is showing them how. “Some only saw the trajectory from teacher to principal but not as education policy makers, community leaders or other higher education positions,” he added. In addition to giving financial assistance so that members can attend the group’s leadership conferences, Terrell said Profound Gentleman can now send members to other education seminars as well. That kind of exposure, he said, can lead to their members going after positions such as advanced-placement teachers and put them in a position to encourage and select more African-American children for advanced classes. Other changes to Profound Gentlemen this year include the size of the group’s membership roll. After the first year, they had more than 500 members, but now it’s less than half that number, intentionally. The members initially divided up into groups, or cohorts, of about 30 men, each with a volunteer team leader. Shaw said they were “naive” to think that at that size they could provide enough of the one-on-one attention that members needed. So in January, all members had to reapply, and for the first time a $25 fee was charged. Members had to set specific goals, which their now-paid team leaders will hold them accountable for accomplishing. The groups are also much smaller. “There are about 12 to 15 men in each group now, and they will each get a minimum of 20 hours of one-on-one coaching a year,” Terrell said. Membership applications are still being accepted, and both say they want to get back to higher numbers as more funds are raised. For now, they feel those they have are more involved in the organization. One of those members is 24-year-old Nicholas Bratcher, a history teacher at the Charlotte Learning Academy. He always wanted to be a teacher, but he attended Johnson C. Smith University, which discontinued its education program about a year ago. 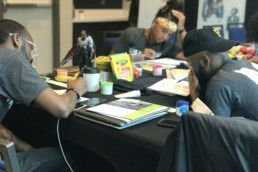 Bratcher said that between Shaw, Terrell and his team leader, he gets the advice he needs when he’s stuck on various problems he’s encountered as a teacher. Just what Shaw likes hearing; he was off to Chicago last week to talk to a member who was thinking about leaving the field.